In my previous article I explained how errors in an ASP.NET Core web application can be dealt with using middleware. I also mentioned that time that you can also use exception filters to handle errors. In this article I will explain how to do just that. In ASP.NET MVC 5 you used the [HandleError] attribute and OnException() controller method to deal with exceptions that arise in the actions of a controller. In ASP.NET Core the process is bit different but the overall concept is still the same. As you are probable aware of, filters sit in the ASP.NET Core pipeline and allow you to execute a piece of code before or after an action execution. 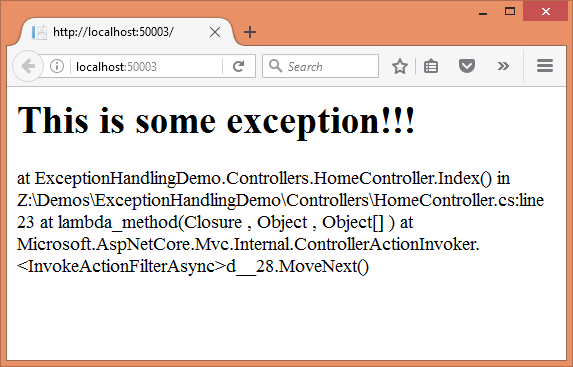 To understand how errors can be handled in ASP.NET Core let's create an exception filter called HandleException and then try to mimic the behavior of [HandleError] of ASP.NET MVC 5. The HandleExceptionAttribute class overrides the OnException() method of t he base class. The OnException() method is called only when there is an unhandled exception in an action. Inside, we create a ViewResult object that represents the custom error page. It is assumed that the view representing the custom error page is Error.cshtml. Later we will write some code to remove this hard-coding. Then the code creates an empty object of EmptyModelMetadataProvider class. This is required because we need to initialize the ViewData of the request and add exception details in it. Then ViewData property of the ViewResult is assigned to a new ViewDataDictionary object. While creating the ViewDataDictionary the IModelMetadataProvider object created earlier is passed to the constructor along with the context's ModelState. We would like to store the exception details into the ViewData so that the Error view can retrieve them and possibly display on the page. To facilitate this HandleException key is added to the ViewData. The exception being thrown can be obtained using context's Exception property. Then Result property of context is set to the ViewResult we just configured. Finally, ExceptionHandled property is set to true to indicate that the exception need not be bubbled up any further. Now open the HomeController and decorate the Index() action with the [HandleException] attribute. As you can see the Error view can grab the exception details using the HandleException key stored in the ViewData. The Message and StackTrace properties of the Exception are then outputted on the page. The ViewName property allows you to specify a custom view name that is then used while forming the ViewResult. The ExceptionType property holds the Type of the exception you wish to handle (say DivideByZeroException or FormatException). This code is quite similar to what you wrote earlier. But this time it uses the ViewName property while forming the ViewResult. Now the [HandleException] attribute specifies two properties - ViewName and ExceptionType. Since ExceptionType is set to the type of DivideByZeroException the [HandleException] won't handle the error (because Index() throws a custom Exception). So, rename Error.cshtml to CustomError.cshtml and throw a DivideByZeroException. This time error gets trapped as expected. It should be noted that [HandleException] can be applied on top of the controller class itself rather than to individual actions. More details about the ASP.NET Core filters can be found here.